Get on the stage in a 3 piece suit that is sure to capture everyone's attention quickly. 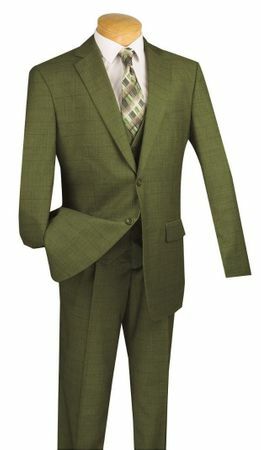 This olive green 3 piece suit features notched lapels and has a classic Italian cut with side vents in the back of the jacket with matching single pleat pants. Show people you know how to wear a suit with style. When it comes to expressing any sort of style when you get dressed, a 3 piece suit is just the way to do it. The reason why is because the over whelming majority of men only wear 2 piece suits for business and Church but when you wear a 3 piece style suit, it tells people that you really take how you dress seriously and aren't afraid of showing it.. Made of wrinkle resistant super 150s Poly/Rayon fabric.